Topics: The Team, Client List, Services, Duplicate Keys, and Lost/damaged Keys. Age: It went live on July 8th 2002, making it over 15 years, 8 months old. ns26.domaincontrol.com, and ns25.domaincontrol.com are its DNS Nameservers. It is hosted by American Registry For Internet Numbers (Virginia, Chantilly,) using Apache web server. 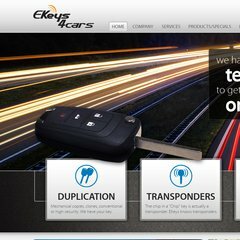 Ekeys4cars.com's server IP number is 97.74.144.135. PING (97.74.144.135) 56(84) bytes of data. A ping speed test response, is timed at 58.5 ms.